Die praktischen und formschönen Brühsiebe von WMF sieben, passieren und blanchieren Obst und Gemüse im Handumdrehen. Jedes WMF Brühsieb ist aus rostfreiem Cromargan® gefertigt und hat ein feines und dabei formstabiles Drahtgeflecht. Der breite Rand und der Griff bilden eine gute Auflagefläche auf Schüsseln und Töpfen. Für jede Zutat und Zubereitungsart bietet Ihnen WMF ein Brühsieb in der passenden Größe an. WMF products are all characterised by quality, functionality and excellent design. The WMF strainers are made to last and are perfect everyday utensils designed to help you whenever possible! Strainers come into their own whenever you need to separate larger pieces of food from finer ones, pour off liquids, or dust powders. WMF strainers provide you with many years of service, sit well in your hand and are extremely versatile. If you're looking for professional quality then place your order from WMF! A strainer is a utensil with an extremely fine wire mesh on a metal frame that gives it stability. It is usually shaped like a ladle and has a long handle. WMF strainers also have a small hook, which allows you to rest them on top of pans, bowls or cups. This means you have both hands free when working in the kitchen, and so can deal with food and other kitchen gadgets easily. You usually use a strainer to separate or sieve food. So for example you can separate canned fruits from their juice when poured out of the can, and easily catch the juice, if necessary, by placing a bowl underneath. You can also use strainers like a colander for straining pasta, rice or vegetables. They are also useful when it comes to straining thick liquids. You can therefore say goodbye to lumps in the sauce, pips in the raspberry jam or pieces of apple in the apple purée. You can sieve flour and baking powder when baking, thus refining the end product. You can use a small, extremely fine strainer to decorate desserts with icing sugar or cocoa powder. In short: Strainers have an almost unlimited number of uses in the kitchen. To ensure that you have the right model for every purpose, WMF offers mesh strainers in a range of different sizes from 8 to 22 cm.  The word "quality" is redefined at WMF. All strainers are made of high-quality Cromargan®, the rust-proof stainless steel from WMF. The polished frame makes them a real eye-catcher, and they can be washed in the dishwasher without any problems. Discover the quality of the products for yourself and try the WMF strainers out!